The key to getting your readers to return to your blog is to get permission to send your blog posts straight to their inbox. 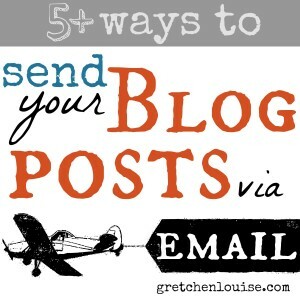 Here are the advantages and disadvantages of 5+ popular ways to send your blog posts via email. If you’re a WordPress.com user, Jetpack is the default subscription option. It’s also available to WordPress.org users through the Jetpack plugin. The advantage of Jetpack is that it’s free and built right in to WordPress.com or to .org with the plugin. A subscription checkbox is even automatically integrated into the comment section. The disadvantages of Jetpack are many (in addition to questions about the Jetpack plugin itself). The emails go out immediately when the post is published, leaving you no chance to edit that typo before every single one of your email subscribers see it. You can’t edit the appearance of the emails at all. Nor can you manually add or remove subscribers from Jetpack. Jetpack subscriptions do not transfer from WordPress.com to WordPress.org (unless you contact WordPress.com for assistance). And if you’re using Jetpack subscriptions on WordPress.com, there is no way to deactivate Jetpack if you want to switch to another service. If you’re a Blogger user, FeedBurner is likely the method you use. And for many years, it was the preferred method of sending out posts via email, just as FeedBurner was the feed “burner” of choice (burning a feed means making it humanly readable rather than appearing as a bunch of code). The advantage of FeedBurner is that it is free and unlimited. The popularity of FeedBlitz rose quickly with the bad press surrounding FeedBurner. Like FeedBurner, FeedBlitz has an RSS to email service in addition to burning feeds. The advantage of FeedBlitz is that it is an all-in-one service. Your email subscriptions are sent out by the same service that burns your feed. I’ve not used FeedBlitz, but disadvantages I’ve heard or seen include: a tough learning curve, a multiple step signup process (two clicks plus a confirmation email to sign up), and the occasional appearance of CAPTCHA on the signup forms. Blog posts are sent out within a three hour window rather than at a specific time. Price: FeedBlitz is $1.49 per month for feed burning only, with the price increasing quickly based on the number of email subscriptions. Unlimited autoresponders are included with the base price. You may have used MailChimp before for a newsletter, but it’s not just for newsletters. You can send out your blog posts via email automatically using RSS to email campaigns. The advantages of MailChimp are that the editor works much like WordPress or Microsoft Word. You have unlimited RSS to email options per RSS feed. You can upload a file directly to MailChimp if you’re providing a freebie to your subscribers. The disadvantage of MailChimp is that it can be confusing to set up RSS to email campaigns because of all the options (but check out my Top Ten Tips for help). Price: MailChimp is free for 12,000 emails per month sent to up to 2,000 subscribers. Autoresponders are only available to paid users. Mad Mimi is a more casual approach to email, but it creates a beautiful newsletter or post by email with super simple steps. The advantages of Mad Mimi are an easy to use interface and great tech support. Few options equal little opportunity for confusion. It’s easy to sign up and set up your campaigns. An interesting Mad Mimi feature is that you can choose single opt in rather than double opt in (no click on a confirmation email required), but this may give you a lot of spam subscriptions. The disadvantages of Mad Mimi are that with the free version you’re limited to a total of 25 image uploads, weird plain text editing, and you have no ability to customize your email templates. You also can’t send out more than one version of a single feed (i.e. daily and weekly) and there’s no file upload option if you want to provide a freebie to subscribers. Price: Mad Mimi is free for 12,500 emails per month sent to up to 2,500 contacts. Drip campaigns are only available to paid users. 6. Aweber, Constant Contact, or other paid service. I’ve heard great things about Aweber as well as other email services like Constant Contact. But so far, the completely free startup of Mad Mimi and MailChimp wins every time. Check out my post How to Create & Build An Email List for a more in depth review of Mad Mimi and MailChimp, as well as details on other popular services. For all my email list tips, visit The Ultimate Guide to Newsletters & Email Lists for Authors & Bloggers. Choose a service that allows you to offer your subscribers options. Let them choose from your newsletter, your blog posts on the day you publish them, or a weekly digest of your latest blog posts. Give them a checkbox for each or provide a drop-down option that includes your newsletter along with each post frequency. Click here for more ideas on simplifying your email lists while providing options to your subscribers. Curious about the affiliate links rumors? Check out my friend Dawn’s break down of the most popular email services and their policy regarding the use of affiliate links: Top 4 Mailing Services and Your Affiliate Links. Speaking of affiliate links, if you’re signing up for a new service, I’d be honored if you used one of my affiliate links: MailChimp, Mad Mimi, or FeedBlitz. What service do you use to send your blog posts out via email? Great article. It touched on the biggest pain point with Jetpack’s auto-send in that you can’t schedule the eblast. I had been using MailChimp’s RSS campaign option for years on a blog that does not have Jetpack installed, and it works great. We were using Feedburner, but the lack of styling on the blasts makes them look old, and not very professional. When I started working with additional websites, I would create the RSS campaigns in MailChimp along with installing Jetpack, however the RSS campaigns do not work. It appears the Jetpack plugin is outputting errors that MailChimp is unable to resolve, but Feedburner is able to resolve. I was curious if this is something you have seen lately? I’ve not seen that issue, Kevin! I hope you’re able to get it resolved. I’m using Feedburner but it looks like they have problem lately. I’m thinking to swith to another provider. The aim of this plugin is One Time Configuration and Life Time Newsletter to subscribers. This plugin generate a newsletter with the latest available posts in the blog and send to your subscriber. We can easily schedule the newsletter daily, weekly or monthly. Thanks for commenting and sharing your plugin. However, I’ve heard that it’s not necessarily a good use of WordPress to use it to send emails/newsletters. I’ve been looking into other mailing services ever since I first saw this post! I’m really tempted to go with Mail Chimp, but it would actually be more expensive for me right now than Feedblitz. Currently, I’m leaning towards testing Aweber. Will let you know what I think! Wow, it’s hard to believe MailChimp is more expensive than Aweber! But it all depends on the level and how the numbers crunch, doesn’t it? Looking forward to seeing what you decide! I’ve been mulling over the idea of moving away from Feedburner, but haven’t yet done anything about it. How complicated is Mailchimp to set up for RSS campaigns? They seem like the best option for me, but the set-up looks a little daunting. Also, another site I found recently is FeedPress. Have you read or seen anything about them? Gretchen is so knowledgeable, helpful, and quick to respond to even the quirkiest of my requests. I truly enjoy working with her. Gretchen is a wealth of information when it comes to WordPress. She makes smart recommendations for plugins and all the behind-the-scenes stuff you don’t want to have to think about!